When Squid cannot connect to ICAP server it shows ICAP Connection Error page. If ICAP server is alive and running when this error occurs please check the following. 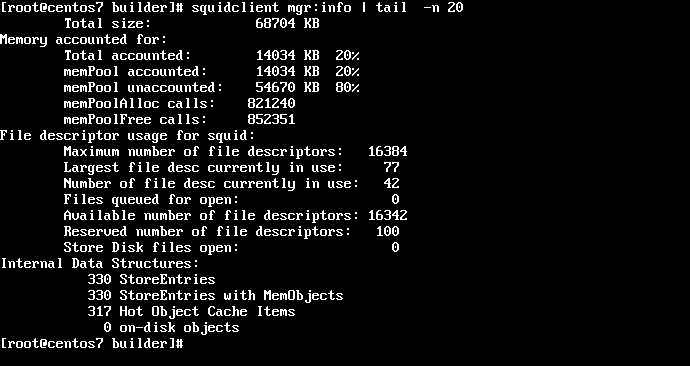 Ensure Squid has enough file descriptors available. Each ICAP connection takes at least one file descriptor and if there are a lot of ICAP connections being made then file descriptors may deplete faster than usual. The easiest way to check the FD limits is to run the squidclient mgr:info command as indicated on the following screenshot. Check the number of connections to ICAP port 1344 in TIME_WAIT state. Currently Web Safety closes ICAP connection after it generates the blocked page so large number of connections in TIME_WAIT may indicate that too many sockets cannot be reused by Squid. Increase level of ICAP module debugging in Squid by adding debug_options ALL,9 to its configuration file, remove the /var/log/squid/cache.log and restart Squid daemon. From now on Squid will dump extensive info about ICAP transactions to log file and after ICAP error occurs again it may be possible to analyze what went wrong. If possible it is also advised to do the dump of ICAP transactions between Squid and wsicapd. Go to UI / Web Filter / Settings / Network, check the ICAP Debug option, click “Save and Restart” button in the top right corner. Reproduce the error and pack *.sent and *.received files in /opt/websafety/var/temp folder - this may give us a better clue about HTTP/HTTPS traffic when error occured.